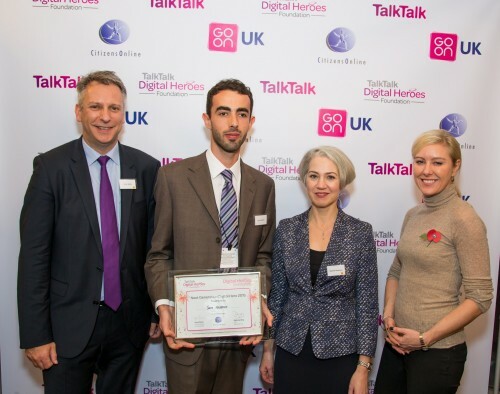 I’m delighted to say that I’ve won the TalkTalk Digital Heroes Next Generation award! After having been nominated early in the year and a month long period of public voting, I was invited to the House of Lords yesterday for the awards ceremony. The ceremony was wonderful, and it was fantastic to meet the winners from other categories in such a special location – the view of The Thames was very special! Below is a video of me that TalkTalk produced for all the category winners. This entry was posted in Apps, Computer Science, Entrepreneurship and tagged award, digital hero, digital heroes, house of lords, next generation, TalkTalk on November 6, 2015 by Sam. 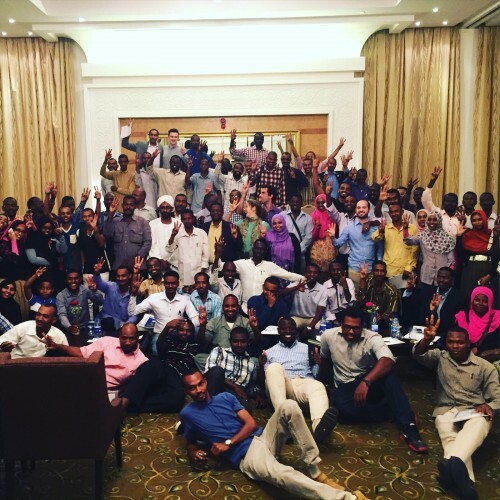 A couple of months ago I saw a post for Kairos Fellows about an all-expenses-paid trip to the Sudan to mentor on a Sudanese TV programme that’s a cross between The Apprentice and Dragons Den. Free trip, I heard? Count me in! I wasn’t entirely sure it was genuine, that it wasn’t an elaborate plan to lure some British idiots out to Sudan, but a quick phone call to the British Council confirmed it was indeed sponsored by them, so I decided to drop the organiser an email who, after some back and forth, offered me place. Getting the Visa was incredibly straightforward: a couple of weeks before leaving, we were told to go to the Sudanese Embassy and tell them we were part of The Mashrouy Programme, which certainly speeded things along. We met the ambassador, and 24 hours later our visas were ready! Six weeks later, having just finished the TechStars demo day that morning, I jumped on an almost entirely empty flight to Khartoum, changing in Jordan. Because of the demo day, I was arriving a couple of days after the start. 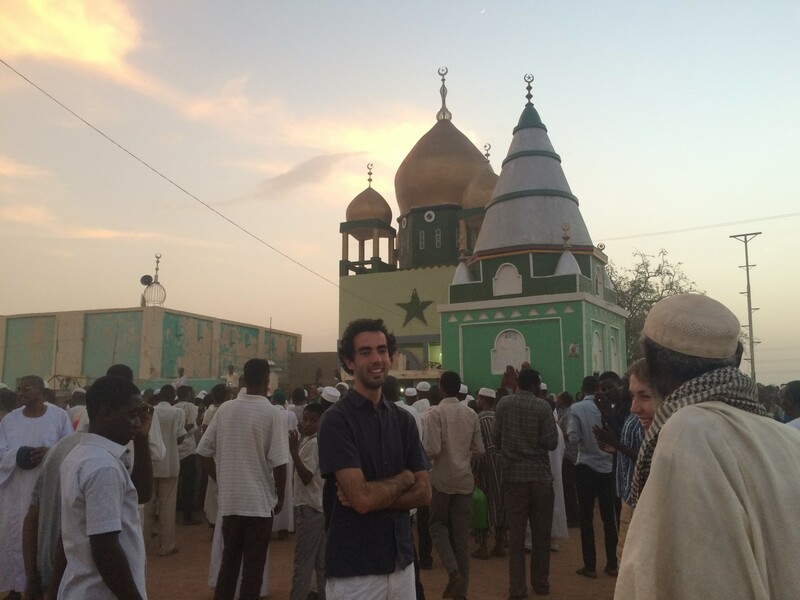 My first moments in Sudan were really eye-opening. I’d been told to meet the British Council’s driver, Mr. Khalifa, who would take me to the hotel when I arrived at 2am. The journey, although only a few minutes long, was incredible as Sudanese roads are very different to those in the UK: there’s large rocks on the motorways, and it’s not considered abnormal to do a u-turn on them. I even learnt some Arabic! The next morning (Wednesday) I met the rest of the team who had come out on the project a couple of days before: Peter McFarlane, Sophie Dundovic and Anthony Catt, who filled me in on the different sessions and the presentations and talks we would be giving. The first event was with the Mashrouy top 100, who were presenting their projects (Mashrouy means ‘My Project’) to the mentors (local mentors and us) at large round tables in the Hotel. It was there that I had my first experience of working through a translator – an experience I will never forget! Obviously communicating is much slower and more effort, but as a result you think through your words and the points you wish to make much more carefully and I found it led to a more directed and concentrated conversation. In the following days we spoke to classes from the 100 about our story, our companies and lessons we have learnt from our experience. On the Thursday I spoke to two classes about how I got involved in Entrepreneurship, my startup and what business was like in Europe at a local business school. After each session I was swamped with questions, and then when I left entrepreneurs wanting to tell me about their companies – it was really surreal! On the Friday we had the Mashrouy Conference and Panel, a public event for a few hundred local business leaders, the Mashrouy 100, and other young people to come and hear us lecture on a topic of our choice and then ask us questions in a panel discussion. This was another translator affair, but a wonderful experience: whilst what you are saying is being translated you have some time to think about the next couple of minutes of your talk until the next translation. There’s also an amusement aspect as well: there were times when a block would change in length (3 minutes to 30 seconds or 2 minutes to 5 minutes), or the audience laughed when I was sure I didn’t say anything funny! One topic of particular interest was what business was like in the UK and Europe vs Sudan/Africa, which turned into a number of really interesting conversations. 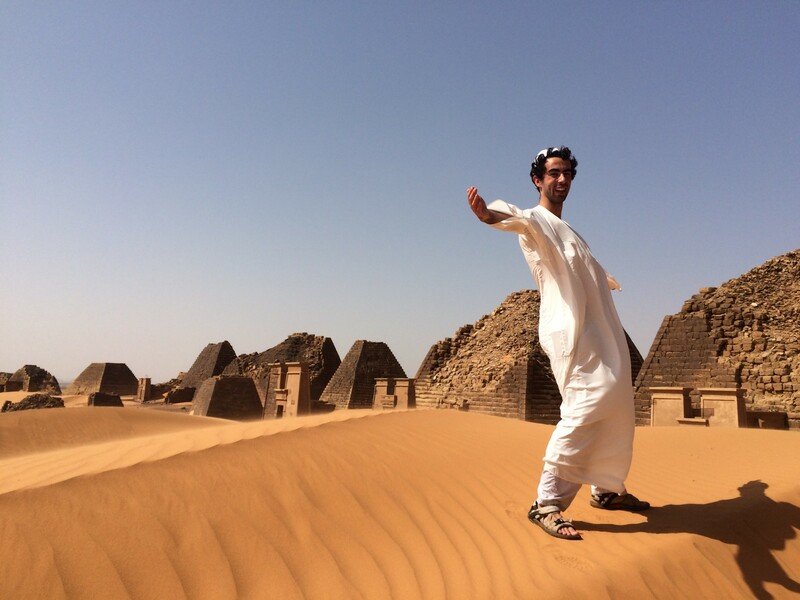 On the Saturday we took a day off to go and see some of Sudan, including the Pyramids of Meroë, the old Royal City and a rural village on the Nile. The pyramids were incredible: untouched and unspoilt (there was absolutely no tourist industry), and we were able to explore them on camels. The village on the Nile was very thought-provoking as well: the poverty was heartbreaking – it doesn’t come any worse. But the people were so happy and welcoming: we were welcomed into the village and the central buildings, everybody wanted to be in our photos, and they even took us out on a local fishing boat on some Nile rapids. 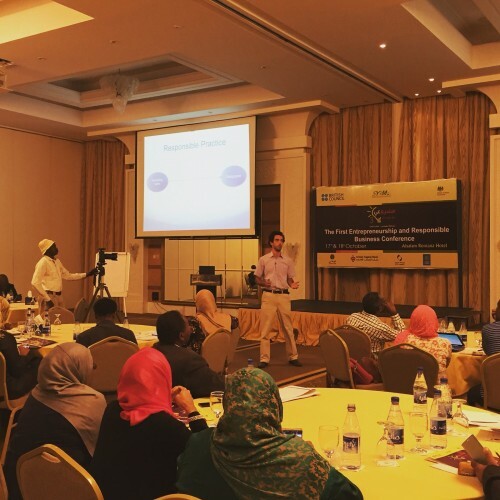 On Sunday the British Council held Khartoum’s First Entrepreneurship and Responsible Business Conference. Hundreds of business leaders from across Sudan came to the event to hear lectures varying from insights and deep-dives into existing large responsible companies, different ways in which business can be conducted responsibly, the idea of Social Impact business and more. I spoke about the Intersection of Social Impact Business and Technology. There were a couple more events that I’ve skimmed over but I’ve tried to cover a range of different events vs covering all of the events. 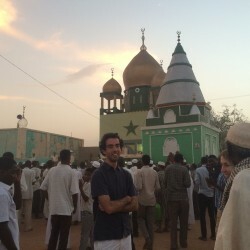 All in all, my time in Sudan was fantastic, enlightening, and even a little bit life changing. I met new people as different to myself as possible, was able to both share my experience and help others trying to start or run a business, and had the most amazing time visiting a wonderful and totally different country! 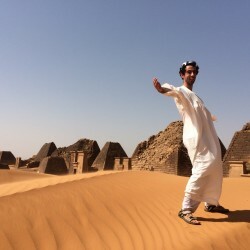 This entry was posted in Computer Science and tagged British Council, Khartoum, Mashrouy, Sudan on October 31, 2015 by Sam. 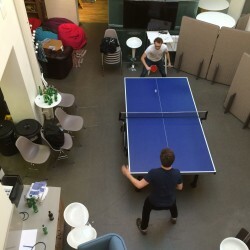 This is a re-post from the pingWHEN blog, kept during our participation in Techstars London 2015. TalkTalk is currently running their annual Digital Heroes awards, and one of our co-founders, Sam Heather, has been nominated. The awards seek to recognise technologists who have not only harnessed the power of technology, but are using it to help others, whether in their community or through the environment. Sam has been nominated for the Next Generation award, which seeks to recognise young people who have used technology to for social good through a variety of projects. Sam’s nomination comes as a result of his work over the last six years to use technology for social good. He’s currently working on pingWHEN, a personal safety app motivated by the statistic that 1 in 4 women on college campus in the United States will be sexually assaulted during her years there. pingWHEN is going through the prestigious mentor-led TechStars accelerator programme in London, having received $120k investment from them. Sam’s previous projects include working on Shy with Julie Markham, a service aiming to provide crucial knowledge about personal and sexual health to those either to shy to ask their family / friends (possibly because of cultural taboos), a common trait of those born since ~2000, or those living in developing countries without access to the raw information. Shy is both a mobile app and an SMS service, to fulfil both of these use cases. Sam also built the first Anonymous Web Browser on the iOS platform called Branon, with the intention of providing free and unrestricted access to information to those living in countries with restricted internet access. You can vote for Sam in the TalkTalk awards here or by visiting http://digitalheroes.talktalk.co.uk/next-generation-digital-hero/. Voting takes just a minute. 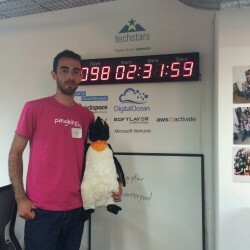 This entry was posted in Apps and tagged pingWHEN, techstars on August 24, 2015 by Sam. This is a blog post in a series written during the first fortnight of our participation in Techstars London 2015. 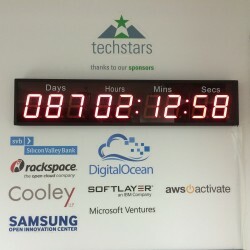 Count down to demo day – 87 days to go! The CEOs had a meeting at 7:30am following, which was surprisingly well attended bearing in mind last nights party went on until 3am. After that, we met with 6 mentors and were able to present the more refined pingWHEN that came from the “<app X> for Safety is <a product or feature idea>” exercise from last night. The sessions seemed to go better than those over the last three days, which the summarising feedback this evening confirmed. A few key ideas came up in the mentoring, including using a call centre to reach out to you in case of possible emergency rather than an automated SMS system, putting the user more in control of what constitutes and emergency. After following up with the mentors we each went our own separate ways to do a bit of a ‘clean up’, and between us applied for three competitions for pingWHEN to boost publicity. 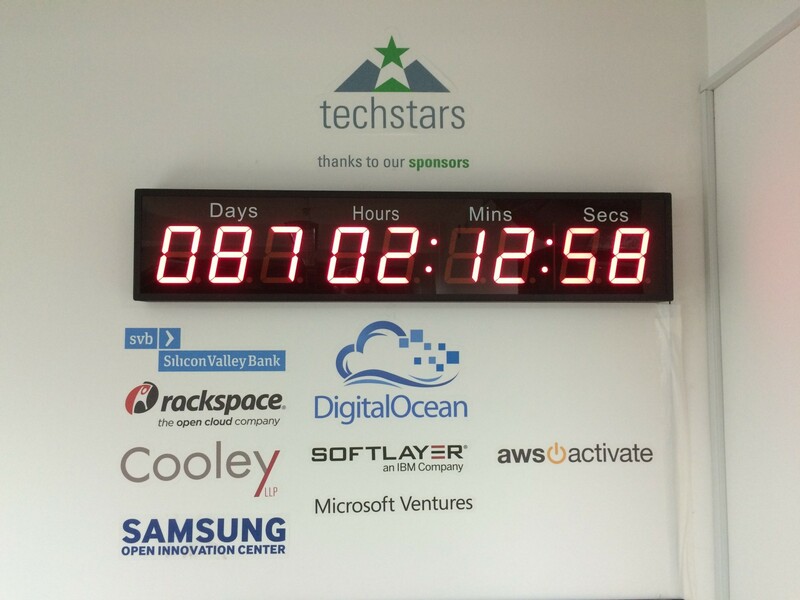 The clock is counting down worryingly fast – it’s now only 87 days until demo day! 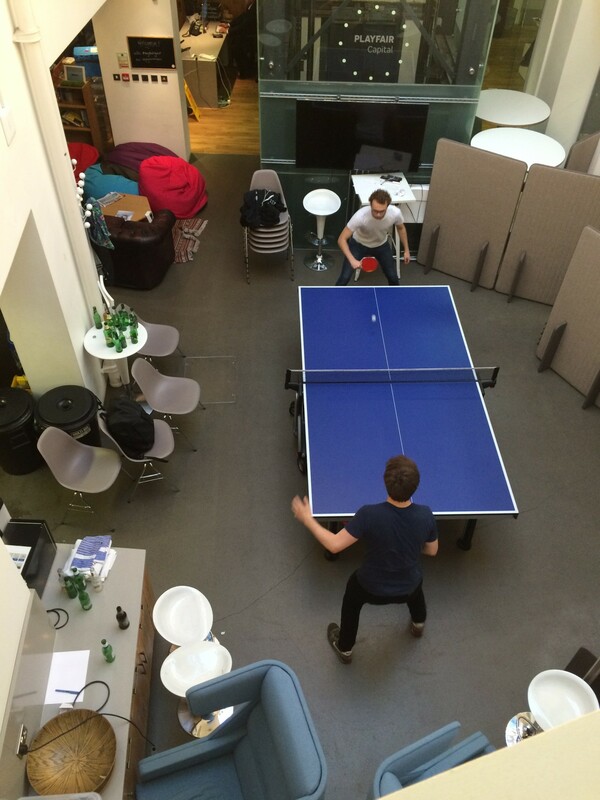 Although there’s still time for a casual game of ping pong! Sam: After working through a few emails and writing two applications to the TalkTalk Digital Heroes competition, I spent time doing market research on personal automation services such as IFTTT and experimenting with what already exists and what works. 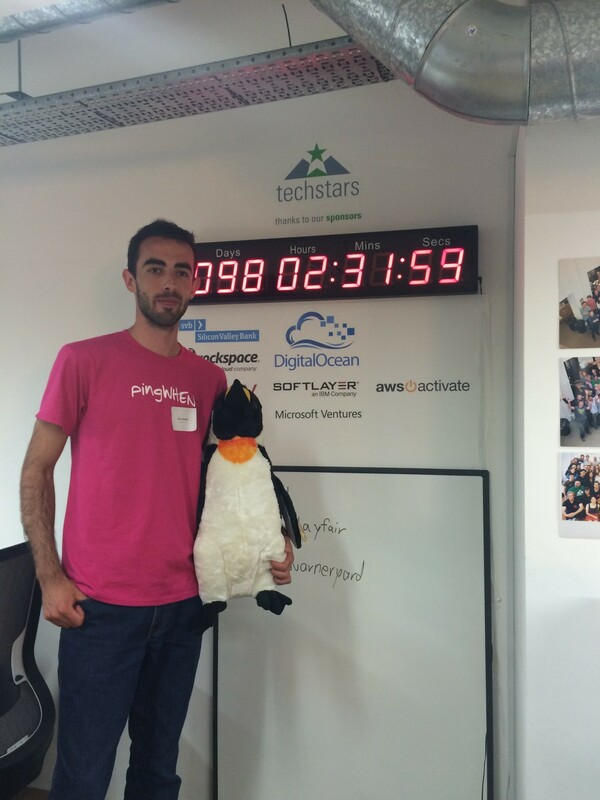 This entry was posted in pingWHEN Blogs During TechStars and tagged pingWHEN, techstars on July 18, 2015 by Sam.